An insane sequence of events are set in motion when CIA analyst Osbourne Cox (John Malkovich) quits his job after being demoted, and sets about writing his less-than explosive memoirs about his work at the agency. Meanwhile his high-strung wife Katie (Tilda Swinton) is planning to divorce him and is having an affair with horny Treasurer agent Harry Pfarrer (George Clooney). When a disc containing Osbourne's memoirs and his financial records is mistakenly left in a gym locker room, it is discovered by employees Chad (Brad Pitt) and Linda (Frances McDormand) who blackmail Osbourne for its return. Their poorly orchestrated plan becomes a problem for the CIA top brass who are increasingly confused and irritated by the actions of the civilian characters. After the Coen brothers' dark and sinister Best Picture Oscar winner No Country for Old Men, comes the dark and sinister Burn After Reading, with its tongue firmly lodged in its cynical cheek. Blend covert CIA operatives, adulterous bed-hopping and the soul-crushing culture of internet dating and you have one of the most shockingly entertaining releases of the new year. The tightly wound conspiracy plot also takes in the mundane lives of lovelorn singleton Linda Litzke (McDormand) who is determined to undergo numerous plastic surgery procedures in order to snag her dream man, her dim but endorphin-charged colleague Chad (Pitt), and their boss Ted (Richard Jenkins) nurses a secret crush on Linda. Just about every character displays mind-boggling levels of blind egotism that only shows up their vapidity, none more so than Malkovich's acerbic portrayal of Osbourne, whose vanity poisons the lives of everyone around him. Even the CIA bosses, safely removed from the chaos of the unfolding events, demonstrate a wicked level of apathy, resigning the fate of their charges to whatever will keep them out of their hair. Violence and misery result, giving a twisted perspective on the American Dream. Yes, Burn After Reading recalls the Coens' previous gilt-edged comedies-of-error Fargo and The Big Lebowski, movies that belie their thriller leanings with massive doses of biting wit and curiously random bloodshed. In fact, the only bit of sense in evidence here comes from the Russians – the supposed enemies of the State to whom Linda and Chad try to sell the CIA disc in a last ditch effort to salvage their rudderless plan. Pitt, with his Vanilla Ice frosted spikes and hi-NRG techno-blasting iPod, offers the most exciting performance. It's refreshing to see him cast aside his Very Serious Actor persona to play this lovable dumb schmuck and he attacks the role with infectious childlike glee. But then again he is in very good company here. The Coens' stature lets them take their pick of the Hollywood crop – so they wrote the script with exactly these actors in mind. It would be impossible to pick just one standout scene, but Harry's unveiling of the toy he has been building in his basement - ostensibly for the woman who has everything - is ridiculous as it is dirty. The Coens are not known for making missteps, if their enviable filmography is anything to go by, and Burn After Reading makes a very worthy addition. It's not the most philosophical Coen creation around, but it's a damn good ride. The Coen brothers are back to their savage best in this darkly humorous tale about American idiots and their sad little dreams. Brad Pitt and George Clooney in a Coen Brothers movie? I’m there. Sounds fantastic. worst movie i've seen in a while. maybe other peoples taste, certainly not mine. Great movie although I must add that Harry is not the couple's mutual friend - Just Katie's and more:-) Secondly the disc is not left in gym by Katie - its left in gym by divorce counsellor's secretary who searches for it in her gym bag and says she'll redo it from her hard drive as she cant find the disc. Yep, Coen brothers have done it again and true to form with usual riveting plots, great cinematography and mise en scene. Excellent film. If you liked Crash or Death at a Funeral you'll love this one. P.S: John Malchovich should get an award for his acting in this one. Excellent all round. My wife and I went to watch, because she's a huge Brad Pitt fan (he needs to win an Oscar soon; he's given consistently good performances for a while now). Anyways, what a weird movie. Is this the Coen way? We left the theatre with a smile on our face, only because of the last scene. I haven't laughed this little in a comedy for quite some time. But not a bad movie per se. Proof again that the Coen brothers must rate as among Hollywood's most overrated filmmakers. Yes, in their lengthy resume, there've been a few gems (Raising Arizona, Miller's Crossing) but, for the rest, it's been more miss than hit. (Even last year's Oscar-laden "No Country for Old Men" is such a literal translation of its much-better source novel that they had very little to do with the film's so-called greatness.) 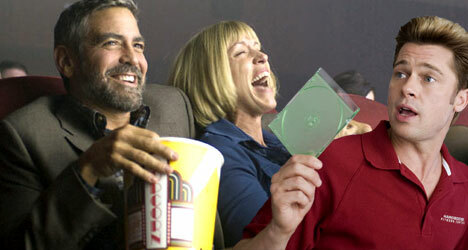 "Burn After Reading" is unfunny, un-satirical, and unable to elicit more than a handful of laughs from a movie audience. (I counted.) Rent "Miller's Crossing" instead. It was utterly stupid. Brad was very funny to some extent, George is seriously old. I can not believe that poeple can be that stupid? What a sorry excuse for a movie - highly overrated - I slept through half the movie. The reviews I read created the expectation that this is a fast paced, witty (although dark), movie. The characters were dumb, the pace was excruciatingly slow and very little was funny. Don't waste your money! I loved this film!! I loved Brad Pitt in this film because I've never seen him play a funny character .